Tarzan was orphaned as a babe and raised by apes. Eggs (voiced by Isaac Hempstead-Wright) got stuck with THE BOXTROLLS. Don't get me wrong, the little monsters are nice enough. Eggs is particularly fond of Fish, who plays barbershop quartet records for him, and is the closest thing he has to a father. It's just that they live in the sewer, eat bugs, and have less than stellar personal hygiene. On top of that, thanks to the power-and-cheese hungry Archibald Snatcher (Ben Kingsley), everyone in the village of Cheesebridge thinks the trolls are dangerous monsters who abducted and ate “the Shropshire Baby”, aka our protagonist Eggs. Snatcher, knowing full well how harmless the trolls are, has built them up as a menace that he and his assistants will gladly eliminate for a fee – namely a fancy white hat to replace his red one, and access to the cheese tasting room where all the politicians in Cheesebridge gather, ostensibly to solve the town's problems but mainly just to eat fancy cheeses. Leader of the white hats Lord Portley-Rind (Jared Harris ) is suitably alarmed by Snatcher's fearmongering and agrees. His daughter Winnie (Elle Fanning), however, is fascinated by the terrifying tales of the Boxtrolls. When she hears the creature's lair has flowing rivers of blood, she's giddy at the thought of it. As the numbers of the trolls dwindle thanks to the efforts of Snatcher and his assistants (Richard Ayoade, Nick Frost, and Tracy Morgan), Eggs is forced to go above-ground to seek help for his adoptive family. Despite being disappointed to find the tales of baby eating and general horror are (mostly) untrue, Winnie offers her assistance. Given that he never listens to her under even the best circumstances, however, what chance do the two young people have of convincing Winnie's father that his perception of the Boxtrolls is wrong? As you might gather, this is kind of a weird film. No surprise, then, that it was made by Laika studios, the same folks responsible for CORALINE and PARANORMAN. They seem to have carved out a niche for themselves making family films for The Addams Family. The same high quality standards of animation are on display here as in their previous efforts, and the voice talent is unimpeachable. Still, despite some delightfully grotesque gags and a plot that, while rooted in classic fairy tale tropes, ultimately veers off into fairly original territory, the film doesn't quite connect, in large part because Eggs is such a bland lead character. Don't get me wrong, we still care about him, but he's easily the least engaging presence in the cast. Hempstead-Wright's voice performance is fine; the character just isn't written that well. Kingsley, on the other hand, is a spectacular villain full of idiosyncrasies and quirks. But in this case, the writers seem to have gone too far in the other direction, trying to create the grossest, most despicable villain they could imagine without thought to how it actually works in the movie. Why does he dress up as a female torch singer? Why does he crave to eat cheese even though it makes him break out in huge boils and hallucinate? You got me. Sure, the character is disgustingly fun, but he's so over the top and the film spends so much time with him that it comes at the detriment of everything else. The film is based on a book called Here There Be Monsters, and though I have not read it myself, the plot summary provided by Wikipedia shows significant differences between the film and its source material. Not that big a surprise, really, but I mention it for those who may be wondering. 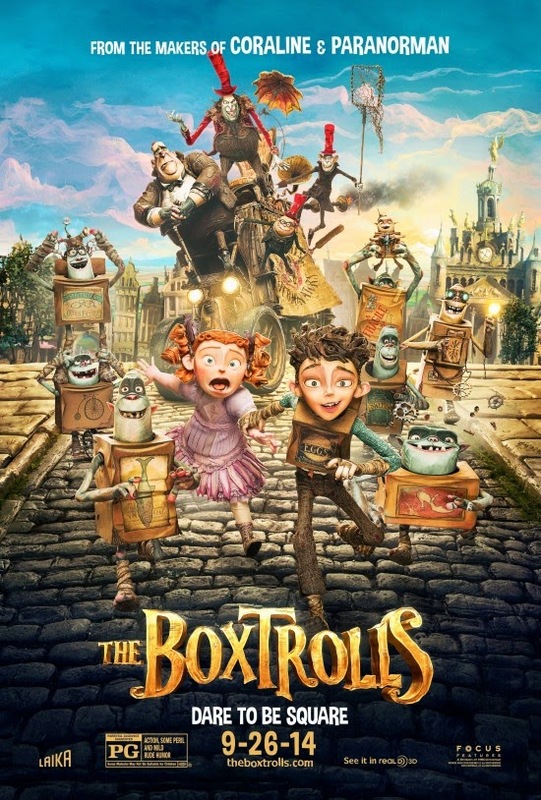 Even when dealing with adaptations of books I have read and enjoyed, I generally try to judge a movie on its own merits, though, and by those standards THE BOXTROLLS is... okay. It's sort of like a cross between one of those classic sixties Rankin/Bass stop motion animation specials like Rudolph the Red Nosed Reindeer crossed with Gahan Wilson and Monty Python. In theory, that should be just the sort of thing I'd love, which makes it all the more frustrating for me that I didn't. 2 ½ out of 4 stars.